Aggressive Inline pushes your inline skating skills to the limit with a new Juice Meter, challenging objectives, and expansive levels. You can choose from an array of professional inline skaters–including Jaren Grob, Chris Edwards, and Shane Yost–and showcase your talent in various interactive skate parks. Perform a variety of manuals, grinds, big-air tricks, wall flips, hand plants, and more, to build up your Juice Meter and avoid elimination. 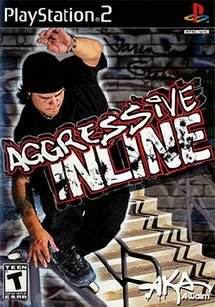 Aggressive Inline also includes a Park Editor that lets you design your own skate park, complete with rails, ramps, and pipes.